HAMPI, INDIA - 28 JANUARY 2015: Small round riverboat loaded with people floating on the river. HAMPI, INDIA - 28 JANUARY 2015: Tractor driving out of the river. HAMPI, INDIA - 28 JANUARY 2015: Man handling motor of boat on river. 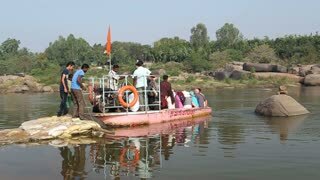 HAMPI, INDIA - 28 JANUARY 2015: Tourists boarding on the riverboat. 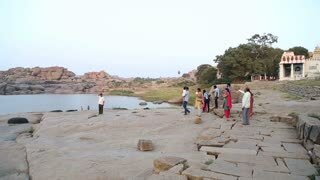 HAMPI, INDIA - 28 JANUARY 2015: Beautiful view of the river in Hampi. 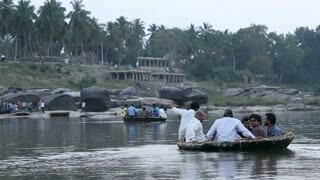 HAMPI, INDIA - 28 JANUARY 2015: People sitting in the small boat on the river in Hampi. HAMPI, INDIA - 28 JANUARY 2015: People leaving of the small boat on the river while man holds it. 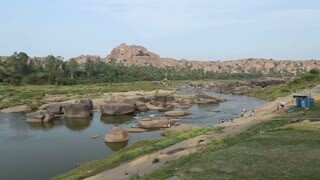 HAMPI, INDIA - 28 JANUARY 2015: View of the beautiful river in Hampi. 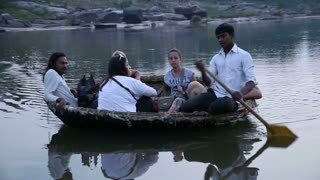 HAMPI, INDIA - 28 JANUARY 2015: Pink boat boarded with people floating on the river. HAMPI, INDIA - 28 JANUARY 2015: Pink boat on the river leaving the dock. HAMPI, INDIA - 28 JANUARY 2015: Old pink boat floating to the riverbank.